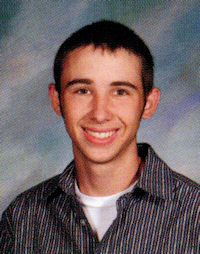 Obituary – Burkett, Tyler Glenn « Perry High School Alumni Association, Inc.
Tyler Glenn Burkett, age 26 of Blackwell, Oklahoma – formerly of Perry, Oklahoma passed away Monday, December 26, 2016 in Blackwell, Oklahoma. Tyler was born March 27, 1990 in Perry, Ok. to Rick and Susan Burkett. Tyler grew up in Perry, Oklahoma where he attended public school. In 2008, Tyler joined the Army National Guard and served in Kuwait during Operation Enduring Freedom. Following his honorable discharge, Tyler found a home protecting and serving our communities with his fellow brothers in blue. Tyler first joined the Watonga Police Department as a patrol officer and then served with Blackwell Police Department until his passing. 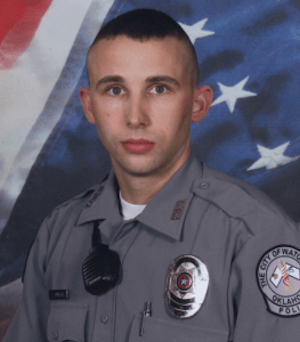 During his career as an officer, Tyler helped teach conceal and carry classes and enjoyed target practice at the gun range. He was well known for his love of the outdoors with fishing and boating topping the list. Most of all he loved the people around him and was known for his engaging smile, his ability to make others laugh and for being a great friend. To many, Tyler was the sweet and ornery little boy; however, he grew into the man who lived tall and defined our aspirations of love, strength, selflessness, empathy and bravery. Tyler’s memory will widely endure as his helping hand held so many hearts throughout his life. The camaraderie he shared with his brothers/sisters of the badge and the military was bar none his greatest love and Tyler will be sorely missed. Tyler is survived by his mother and step father: Susan and Steve Pankhurst of Perry, Ok; father and step mother: Rick and Beverly Burkett of Pawnee, Ok.; One sister: Hannah Burkett of Pawnee Ok.; One brother: Nicholas Burkett of Norfolk, Va.; Two step Sisters: Jennifer (Ronald) Hardin of Mustang, Ok. and Kayla Johnson of Mustang, Ok.; Three aunts: Stephanie (Darrell) Campbell, Nancy (Randy) Martinez, and Lois Ann (Irvin) Haken; And Cousins: Shannon (Josh) Baker, Susan (Chris) Atkins, Trey (Bobby) Campbell, Matthew and Jacob Haken, Mimi Romo, Heather Will, and numerous others. Preceded in death by Grandparents; Kenny and Gerry Alstrom of Perry, Ok., Juke and Glenda Burkett of Perry, Ok.
Funeral services will be held 10:00 AM, Tuesday, January 3, 2017 at First Baptist Church in Perry Oklahoma followed by interment at Grace Hill Cemetery.